After receiving gifts at a wedding, a shower or for a birthday, you will want to send thank-you notes. Thank-you notes can be quite pricey and impersonal, so you may want to make your own. With a computer, Microsoft Word 2007 and a color printer, you can print your own thank-you notes quickly and at half the cost of store-bought notes. Set up the page size in Microsoft Word for 8 1/2 inches by 11 inches. Insert a cell into the page with two columns and two rows. This will establish four thank-you cards per page. Hold the cursor area down on the bottom right corner of the cells, and gradually stretch the entire cell unit across the page to the bottom right corner. This will create four cell spaces that measure 3 1/4-inches wide by 4 1/2 inches tall inside a page with 1-inch borders. Insert "Thank You" in 36-point font centered across the top of each cell space. Double space down, and write a brief thank-you note inside each cell space. Personalize these cards each person, or write a similar message for everyone. 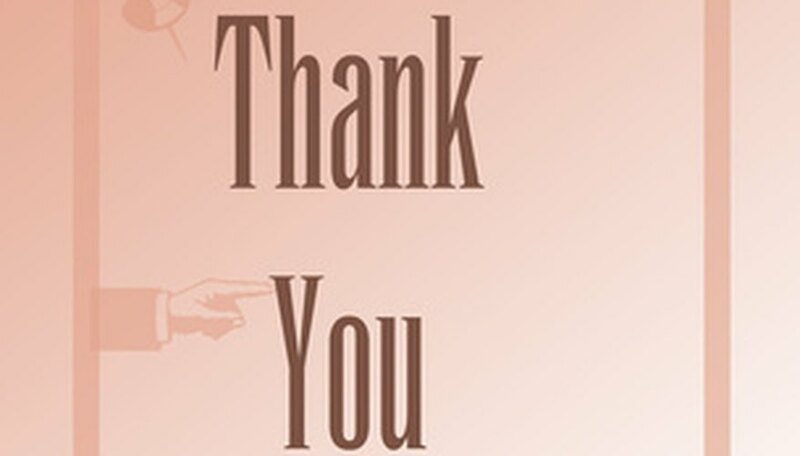 Change the color of the font, or add a small image to each thank-you note. Click on the "Print" option from the top left-hand drop-down menu. A box will pop up, prompting you to select a printer. Click on the "Properties" button to the right of the selected printer name. Click the tab in the pop-up box that reads "Paper/Quality," and set the Print Quality to Maximum dpi. This will provide the best print quality for the notes, which is especially important if they contain images. Insert matte photo paper into the printer. This is a great option for printed notes because it is a much thicker paper than standard printing paper, and it is not too glossy. Click "OK" in the pop-up box and "OK" in the "Print" box. The note cards will start to print, four per page. The print process may be slow due to the maximum dpi setting. Cut out each note along the black cell lines. This is an important step, so take your time, and never double up papers as this can result in cutting off the lines. Mail the notes in 4-inch-by-6-inch envelopes.